Update your wardrobe with the stylish and comfortable Genuine Dickies Flat Front Flex Pant. Designed in a cotton-polyester blend fabric, it resists wrinkles and abrasions. Better yet, these Dickies men's pants can be worn straight out of the wash. Carry all your belongings, from your wallet to your keys in the multi-use pockets. It has a minimalistic look with single button closure with zipper flies. This wrinkle-free men's pants design includes belt loops for your convenience. 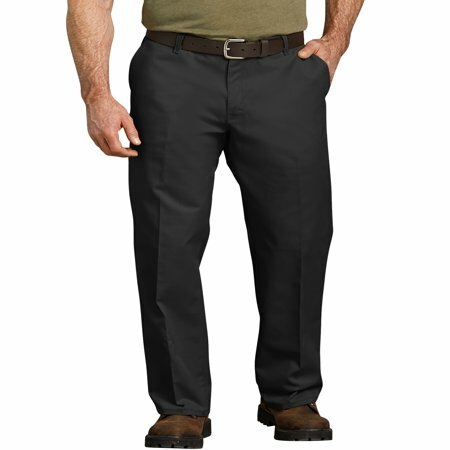 These Genuine Dickies Flat Front Flex Pant With Stain Release, are Moisture Wicking And Wrinkle Resistant. This style is also available in Men's Big sizes. Best Pants! Last so long! My son is a skateboarder and he only wears Dickies! Best work pants ,they last for years do not fade and very comfortable . Good products, however you now have so many differnt names and styles of pants thatI dont know what will fit or how. Relaxed fit will be good for very large people. I bought this pants for their light weight and comfortable, looks. Good fit. Like the placement of the utility pocket. I purchased the pants approximately a month ago ordering my size that normally I wear in all my other clothes. The concept is great, but they are not sized to fit me. Unable to wear now. I bought these pants on line,worst fit! They run about 1 1/2 inch's to big. And quality control lacks attention to detail! On one pair the zipper not fully sewn in.I won't. buy on line again!! Easy reach is one thing. However, once you get there you think there would be a real pocket to put your hand into - not a tiny one. Thank you for your feedback. We will share this with our marketing and design teams.